Soufflés are much more forgiving than they are given credit for, and as far as I’m concerned soufflé horror stories are nothing more that the result of bad recipes and (sub)urban legend. An extremely tall soufflé is really just a stunt for presentation’s sake, and in reality if you took a bite of a soufflé at its fluffiest and most glorious moment, you would burn the bajeezus out of your mouth. Even 10 or 15 minutes after a soufflé falls (which is inevitable! ), it will still taste delicious. This is my riff on a very traditional soufflé that I’ve made gluten free using buckwheat flour. As an added bonus, buckwheat flour adds a delightfully nutty taste that regular flour lacks. I used a vintage, raw milk cheddar for this recipe, but any variety of sharp cheese would make for a delicious result. Whatever cheese you choose, be sure not to skip the nutmeg – it adds a classic flavor to the soufflé that shouldn’t be missed. I think this recipe is appropriate for any time of the day, but it would make for a perfect dinner alongside my Kale Salad with Hazelnuts, Dates, and Orange. You’ll need 5 – 6 cups total volume amongst your baking dishes. That can be six 2″ ramekins, four 3″ ramekins, one medium souffle dish, or whatever combination works for you. Unless you’re really trying to impress someone, there are no rules here. 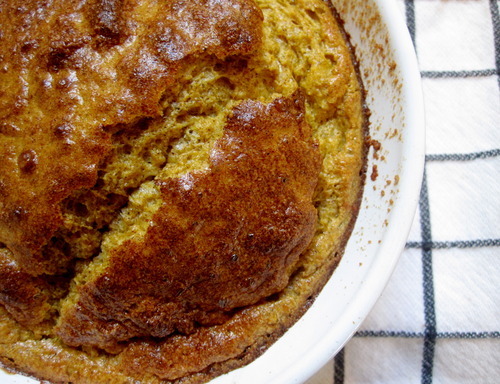 The soufflé will rise in any baking dish, so just go for whatever is closest to the right size. Preheat the oven to 375 degrees. Grease your dishes lightly with butter and then dust them with Parmigiano-Reggiano, rotating and tapping the dish so that a little cheese sticks to the butter all around. Melt the 2 Tbsp. butter in a small saucepan over low heat. 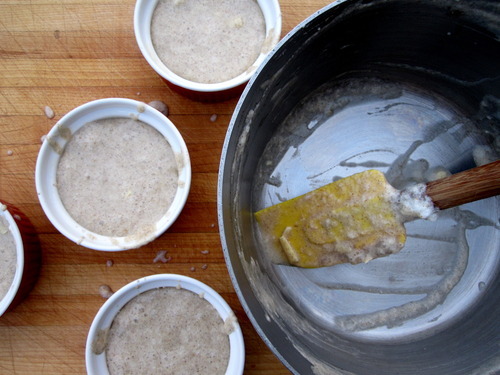 Sprinkle in the buckwheat flour and stir together to form a sand-like paste. 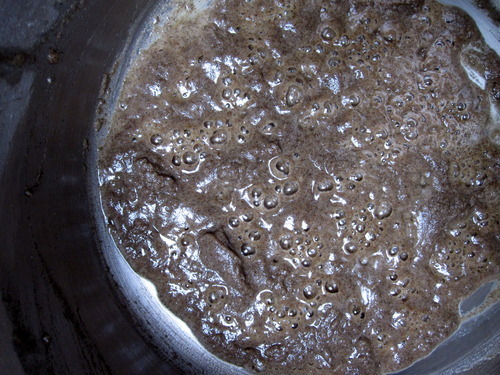 Allow the mixture to bubble for 2 or 3 minutes, stirring often. Once the mixture has been bubbling for a few minutes, add the milk, paprika, nutmeg, and salt, and increase the heat to medium. Whisk to combine everything thoroughly, and allow the mixture to come to a simmer. Once simmering, continue to whisk for 1 or 2 minutes, or until the mixture thickens noticeably. Once thickened, remove from the heat and set aside to cool slightly. While the mixture cools, separate your eggs and grate your cheese. Place the whites into a medium mixing bowl or the bowl of a stand mixer, being sure there is no yolk present. Place the yolks into another small bowl. Grate the cheddar cheese on the large holes of a box grater until you have one very loose cup. Return to the saucepan and add the yolks, one at a time, to the thickened milk mixture, whisking with each addition. Add the cheddar and the 2 Tbsp. of Parmigiano-Reggiano and stir to combine. Set aside again while you whip the egg whites. Using a stand mixer with a whisk attachment or a hand mixer, whip the egg whites until they are bright white and voluminous, about 2 minutes. The whites should hold their shape (rather than leaning to one side or collapsing) when the whisk attachment is rotated and pointed at the ceiling. This stage is called “stiff peaks”. Now, the (allegedly) tricky part: folding the two mixtures together. The point here is to incorporate the whipped whites into the yolk mixture without losing too much of that lovely volume that we’ve created in the whites. Start by adding half of the whipped whites to the yolk mixture, and using a spatula, gently fold the mixture (scoop from the bottom and gently lay over the top in an exaggerated circular motion), until mostly combined. It’s perfectly fine for some bits of white to remain. Add the second half of the whites and once again, fold gently so that the two components *almost* come together. The mixture should be very foamy and speckled with bits of egg white. Transfer the mixture to your prepared soufflé dishes, leaving at least 1/2″ of room at the top for small dishes, and 1″ of room at the top for a large dish. Place the dish(es) on a sheet pan for easier handling, and move them swiftly into the oven! With a large soufflé, you may want to check for doneness by inserting a small, sharp knife into the center of the dish. If anything comes out runny, just pop it back in the oven for 5 minutes. If it’s magic you’re going for, take the soufflé(s) directly from the oven to the table before they begin to collapse. Be sure to allow them to cool for a few minutes before digging in. This entry was posted in gluten free, perfect health diet, vegetarian and tagged buckwheat, cheddar, gluten free, perfect health diet, regular, souffle, vegetarian. Bookmark the permalink.